Artifacts from the Zero fighters downed at Pearl Harbor have been well documented at j-aircraft.com and a recent discussion there focussed on the Niihau and Iida examples. The top image displays the measured values of the current appearance of the artifacts. 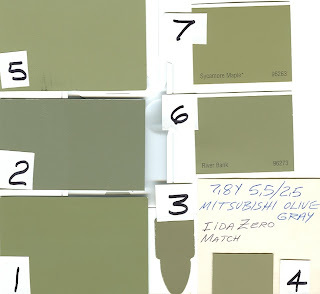 Top row is the well known Iida example with its closest matches to FS 16350, which is not quite green enough, and RAL 7034 Gelbgrau (yellow grey), which is slightly too dark. The Iida artifact was recovered soon after the crash and the piece is well preserved with the paint still glossy. In the second row is the Niihau artifact shown both after the patina was rubbed away and before. This piece had been long exposed, and was badly weathered and degraded. Bottom row are examples of J3 'Hai Iro' and I3 'Tsuchi Iro' for comparison. If we accept the rubbed Niihau artifact as evidence of the original colour it may sit well as an exposed and faded example of the later J3 on the one side, whilst on the other side the Iida example is perhaps a good representation of the colour as it appears age-darkened and ambered. Although seductively close in appearance, I3 'Tsuchi Iro' appears just too dark and too brown to be representative of these colours. Both examples appear to match quite well the description "J3 grey colour slightly towards amber colour". The second image is a montage presentation by Ken Glass. Item 1 is Greg Springer's match to the Iida A6M2 artifact, made full strength using ModelMaster enamel paints. Item 2 is ditto for the Pearl Harbor 'Hospital Kate' relic. Item 3 is Munsell 5 Y 5/2. Item 4 is Munsell 7.8 Y 5.5/2.5, a special chip made to order by Tom Hall and purchased from him. Item 5 is Greg Springer's match again but with 30% white added for 'scale effect'. 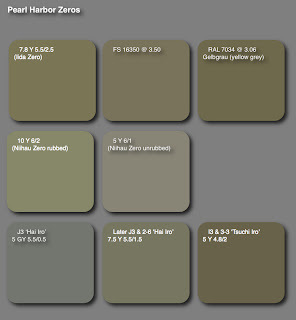 Items 6 & 7 are Wal-Mart house paint color chips matched to the above and which are said to be more commonly available in the USA than FS 595b. Acknowledgements to Greg Springer, James F Lansdale, Jim Long and Tom Hall for primary data.